Irish Pub meets Seafood Restaurant. The Green Marlin is owner Lou Kohbauer’s vision brought to life. 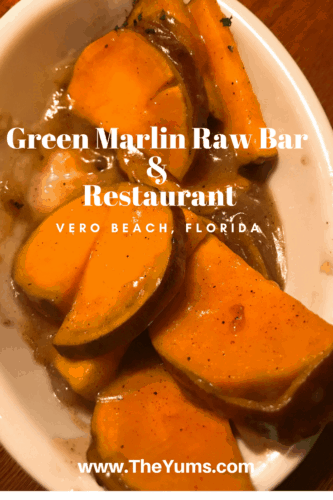 Menu: Green Marlin’s cuisine is reflective of Lou Kohbauer’s desire to be the place in Vero Beach for fresh seafood and Irish comfort food with a Florida twist. Mussels, Clams, Oysters, and Shrimp are the raw bar offerings, with the addition of Stone Crab in season. The Bait Runners (appetizers) include choices like Ahi Tuna Poké, Mahi & Scallop Cake, and Rueben Eggrolls. Seafood choices dominate the dinner entrees. But the burgers….with 13 burger choices, there is something for everyone. With some out-of-the-norm burgers, you won’t be disappointed. The Kung Fu Burger, topped with sautéed mushrooms, sweet soy, provolone cheese and wasabi mayo, delivers a tasty, flavorful punch to your palate. For an unusual choice, try the Au Poivre Burger. Topped with black pepper, sautéed mushroom and brandy cream sauce you will feel like you are in heaven. Dessert lovers will want to skip the meal all together and go straight for dessert! The grapefruit pie is out of this world – think Key Lime pie but with grapefruit. This slice of dessert is tangy, refreshing and a little slice of heaven. Thoughts: With a cheery, homey feel, the interior boasts handcrafted art pieces created from reclaimed wood throughout the space. Wooden booths and tables bring warmth to the interior. We love the salad bar that includes three types of fresh lettuce, carrots, cucumbers, garbanzo beans, shredded cheese and other savory items. Homemade salads like tuna and chicken, couscous and an Asian noodle salad are also included on the bar. My favorite choices on the salad bar are the homemade potato chips with a homemade onion dip with a bit of spice to wake up your taste buds, and the homemade chicken salad with chunks of fresh chicken in a light sauce. Raw Oysters Sushi Style with soy sauce, seaweed salad, and a siracha and wasabi aioli. The soy sauce, seaweed salad, and aioli bring a new taste twist to raw oysters. The textures of the oysters paired with the seaweed salad complement each other, and the aioli gives a delightful spicy hot finish to the dish. Served on a bed of crunchy fried wontons, the Ahi Tuna Poké will transport you to the islands of Hawaii where Poké is a staple. This appetizer comes in two sizes – a small 3 oz serving or a large 6 oz serving. We like to share the 3 oz serving. Rueben Eggrolls are Kohbauer’s creation. Corned beef, sauerkraut, and swiss cheese are fried in an egg roll and served with a side of Thousand Island dressing. If you are a lover of Corned Beef, you must try these egg rolls! For a hearty soup choice, the Seafood Gumbo is tasty and rich. Filled with shrimp, scallops, and sausage, coupled with a salad or an appetizer, this soup makes a meal. All of the burgers are fantastic choices and are cooked to order. Arriving hot and juicy they are flavorful and excellent comfort food. I like to accompany my burger with a side of drunken sweet potatoes. This dish is like eating tiny slices of candied sweet potatoes! Green Marlin has a full-service bar and the cocktails are fantastic! House specials are offered all day long and include Guinness on draft, Green Marlin Lager on draft, Copa Chardonnay wine, and a Goombay Smash cocktail. Dining at the Green Marlin is a delightful experience, and one that will leave you sated, and dreaming of coming back another time. Yumms is right. Thanks for the share Betsi. I’m thinking of a Florida trip next winter. I’ll put this spot on the list.